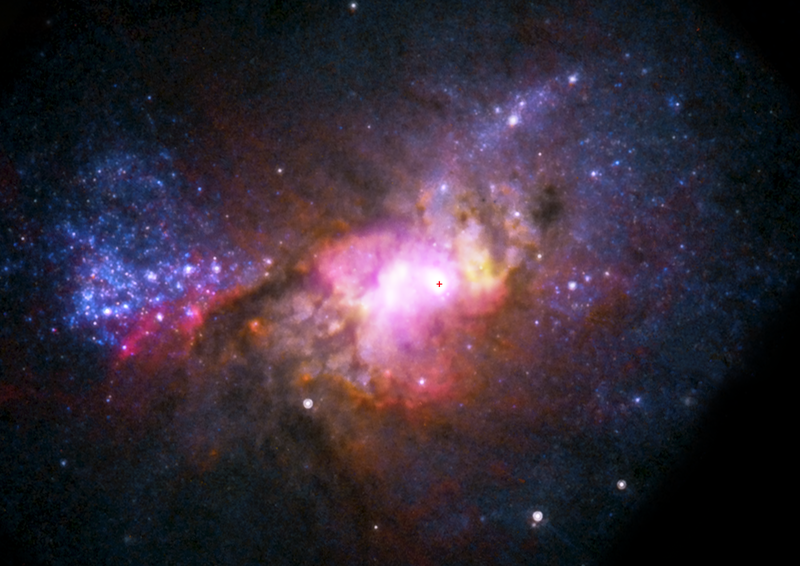 The image is a composite of images from Hubble (red, green, and blue), radio images from the Very Large Array in New Mexico (yellow), and X-rays from the Chandra Observatory (purple). The cross marks the location of the black hole. Henize 2-10 is pretty dinky, only about 3000 light years across — the Milky Way is 100,000 for comparison. It’s about 30 million light years away, which is kinda sorta close by, at least close enough to get a decent look at it. Now, we know that big galaxies like ours have these monster black holes in their very centers; the Milky Way’s is about 4 million times the mass of the Sun. Many galaxies have much larger ones, like Andromeda which harbors one 35 times as massive as ours. Some smaller galaxies have supermassive black holes as well, but in general these dwarf galaxies have some structure to them, with a well-defined core. Henize 2-10, as you can see, it a mess! 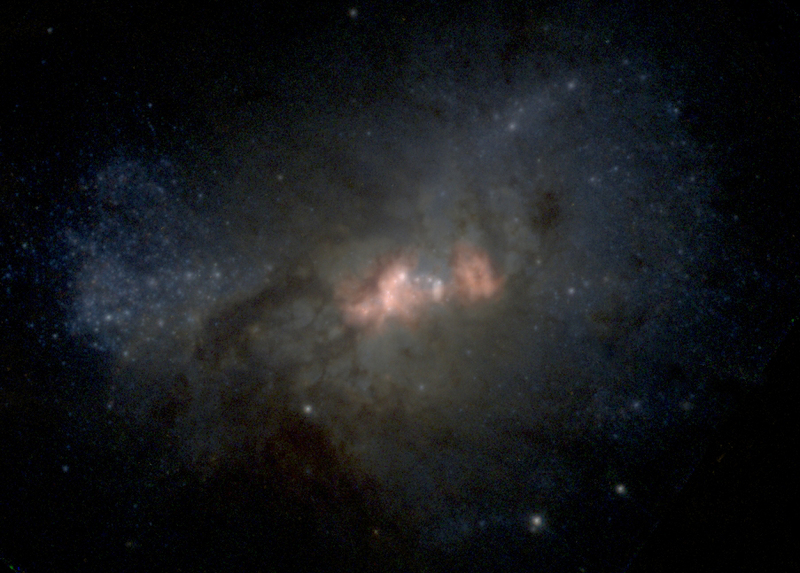 It doesn’t have much overall structure, which is why it’s classified as an irregular galaxy. The thinking for big galaxies is that the black hole forms at the same time as the galaxy itself, and to regulate the growth of each other. When you look at lots of big galaxies, there’s a pretty clear overall correlation between the mass of the black hole and the galaxy around it. So it’s pretty weird that Henize 2-10 has a supermassive black hole at all, but it turns out the hole is also about a million times the mass of the Sun — that’s pretty freakin’ big for such a tiny galaxy! That’s 1/4 the mass of our own black hole, in a galaxy that itself is far smaller than ours. As I wrote earlier today, black holes can focus and expel tremendous beams of matter and energy which blast away from the hole. In this case, these beams have slammed into material hundreds of light years away, well outside the core of Henize 2-10, lighting this gas up at different wavelengths. You can see that as the yellow (radio) blobs to the left and right of the black hole’s location in the big picture at the top, or as the pink areas in this smaller inset image of the galaxy (which just shows the Hubble image only). The bright region around the black hole is also bright in X-rays, a dead giveaway that the black hole is actively feeding. So why does this goofy galaxy have a dragon at its heart? The Milky Way as two companion galaxies, called the Magellanic Clouds, which are roughly the same size as Henize 2-10, but neither hosts a black hole like this one. What makes Henize special? That’s a good question, and one for which we don’t have a good answer yet. But finding special cases like this help astronomers constrain their ideas; any models they have for black hole formation and growth now have to account for this tiny, amorphous galaxy that doesn’t seem to care that it’s breaking the mold.